Purpose: This study was carried out to see the results of glycerol-preserved cornea (GPC) in emergency situation when fresh corneal tissue was not available. The aim was to study the outcome of corneal transplantation using GPC. Methods: This was a retrospective study. The medical records of all the patients were reviewed, who underwent keratoplasty using “GPC” during the period from October 2011 to December 2015. The indication of keratoplasty, duration of preservation of the GPC, and its outcome were analyzed. Descriptive statistics were applied. Results: Out of the 222 penetrating keratoplasty (PKP) performed over the study period, the GPC was used in 34 patients (males = 31, 91.2%) aged 15–74 years. Therapeutic keratoplasty was performed in all cases in this cohort except one in which tectonic keratoplasty was done. The primary indication of PKP (91.2%) was infectious keratitis. Of these, 20 (64.5%) patients presented with perforated corneal ulcers. Post-PKP, ocular anatomy was preserved in 91.2%, and visual acuity of perception of light positive and accurate projection of rays in all the quadrants was obtained in 76.5% cases. Complications included glaucoma (n = 12, 35.1%), phthisis bulbi (n = 2, 5.9%), and graft reinfection and endophthalmitis after PKP (n = 1, 2.9%). The secondary procedure post-GPC and PKP were trabeculectomy with mitomycin C (n = 7, 58.3%) in patients not controlled on topical antiglaucoma medication. Optical keratoplasty was performed in (n = 3) 8.8% patients and triple procedure in (n = 2) 5.8% patients with good visual acuity postprocedure. Conclusions: Acellular GPCs are useful in emergency keratoplasty to avoid loss of vision and can save the eye. Globally, corneal diseases are the third leading cause of blindness after cataract and glaucoma. Approximately 7–9 million people become blind due to corneal diseases. Of this, 90% reside in developing countries. Despite huge burden, corneal blindness remains one of the treatable causes of blindness, if treated appropriately and on time. The causes of corneal blindness vary geographically, and social and economic factors play a significant role. Corneal scarring is the most common indications of corneal transplant in the developing world., In contrast, pseudophakic bullous keratopathy, keratoconus, and Fuchs endothelial dystrophy are the leading indications of corneal transplants in the developed countries. Corneal transplant is the most successful organ transplant and is the definitive treatment of corneal diseases that may cause blindness. There is a severe shortage of donor eyes in India. The current cornea procurement rate according to eye bank association of India statistics in 2015–2016 was 52,758 corneas with a utilization rate of 43% (unpublished data). A significant number of donor cornea is unsuitable for corneal transplant. We would need approximately 277,000 donor eyes to perform 100,000 corneal transplant in a year in this country. This is approximately 20-fold from the donor eyes currently available in India. Limited tissue availability and deficiency of trained corneal surgeons are the factors that make eliminating cornea-related blindness challenging, especially in the developing countries. The problem is further compounded by poor compliance and follow-up of patients., The ever-increasing gap in the demand and supply of the fresh corneal tissue (FCT) may possibly be circumvented by the utilization of glycerol-preserved cornea (GPC) tissue. Glycerol preservation is a simple technique of long-term storage of acellular corneal tissue, and one of the major benefits of this method is the fact that corneal tissue can be safely preserved up to 5 years after harvesting. GPC has no viable endothelium and can be used for lamellar corneal transplant that does not require high-quality tissue. GPC can be used in emergencies like perforated corneal ulcer or globe rupture to maintain the globe integrity by therapeutic or tectonic keratoplasty. The study was undertaken to analyze the indications and the outcomes of cases of infectious keratitis managed using a GPC tissue when FCT was not available. This was a retrospective study approved by the Institutional Ethics Committee according to the tenets of the Declaration of Helsinki. Hospital records of patients who underwent keratoplasty from October 2011 to December 2015, where corneal transplant was done using GPC, were reviewed and included in the study. Experts in the eye bank evaluated all donor corneas. Cornea, which was deemed unsuitable for optical penetrating keratoplasty (PKP), was preserved at 4°C in a sterile glass bottle having sterile glycerin solution. The duration of storage of GPC ranged from 1 to 3 months. At the time of surgery, the donor corneal button was soaked for 10 min in sterile basal salt solution (BSS) to wash away the residual glycerin and then trephined as per the requirement. Corneal trephination was done very gently as most of the recipient corneas were perforated at the time of surgery or had an impending perforation. A 15° side port was used to enter the anterior chamber (AC) from the trephined area. The AC was formed using viscoelastic (either from the limbal side port if the lesion was small or from the trephined area if the lesion involved the entire cornea). Corneal scissors were used to cut the rest of the recipient cornea. All the infiltrates and debris in AC were removed and washed with BSS, and anterior synechiae were released with viscoelastic. Posterior synechiae were also released, and the posterior chamber was washed thoroughly taking care not to injure the lens. The corneal button was trephined 0.5 mm oversize in lesions involving <1 mm of limbus and 1 mm oversize in lesions up to the limbus or involving sclera. The graft was sutured using 10-0 nylon suture. Interrupted suturing was done in all cases. At least two iridectomies were performed before the suturing of graft, due to the difficulty in visualizing the AC through the rehydrated donor cornea. AC was very carefully washed with BSS and reformed with air. We did not remove the crystalline lens in any of the cases, except one, where there was a corneal perforation with lens extrusion. Based on the clinical picture and microbiological reports, all the patients received topical and oral antimicrobials. Demographic data, presenting clinical features, the indication of PKP, secondary procedures performed (if any), and the outcome of the surgery were compiled and analyzed. Out of the 255 keratoplasty performed over 4 years, 34 patients underwent PKP with a GPC. All patients hailed from rural areas, their age ranged from 15 to 75 years, and 91.2% (31) were males. Time to seek specialist care from the onset of symptoms ranged from 1 to 5 months. All the patients either received topical or systemic medications or both at the time of consultation. Few patients were continuing topical steroids, or they had instilled topical steroids in the past. We did 33 (97.1%) therapeutic penetrating keratoplasty (TPK) and one (2.9%) tectonic PK using GPC. The length of follow-up post-PKP ranged from 12 days to 56 months (median = 195 days; interquartile range = 342.5 days). The primary indication (91.2%) for PKP was infectious keratitis and two-third of these patients presented with corneal perforation [Table 1]. Clinically, 12/31 (38.7%) patients had a bacterial infection; 9/31 (29%) had fungal infections, while 1 (3.3%) patient was HIV positive and had developed postherpes zoster keratitis. Remaining (n = 12) had mixed infection. The graft size ranged from 8.5 to 11 mm. All grafts showed delayed epithelialization. Reepithelialization was achieved in all the cases with a bandage contact lens and five patients underwent amniotic membrane transplant. All but one graft healed with vascularization [Figure 1]a and [Figure 1]c; the odd patient developed reinfection of the graft with endophthalmitis warranting enucleation. After PKP, 12 (35.1%) patients developed glaucoma, out of which 7 underwent trabeculectomy with intraoperative application of mitomycin C 0.02% for 3 min. Remaining five patients maintained normal intraocular pressures on the topical antiglaucoma medications. Five patients out of 34 patients underwent optical keratoplasty (OPK) with FCT [Figure 1]b and [Figure 1]d 3–5 months after TPK following resolution of their ocular infection. The best-corrected visual acuity with glasses in these five patients ranged from 6/36 to 6/12 Snellen acuity [Table 2]. Ocular integrity was maintained in 31 (91.2%) patients and visual function was maintained with light perception and accurate projection of rays in all the quadrants in 30 (88.2%) patients [Figure 1]e and [Figure 1]f post-transplant with GPC. All 31 patients had a normal ocular ultrasound on follow-up. Five (14.7%) patients regained good visual acuity after OPK with FCT. As mentioned above, one patient had to undergo enucleation following the development of infection and endophthalmitis after corneal grafting. Phthisis bulbi developed in 2 (5.8%) patients (post pars plana vitrectomy with TPK for endophthalmitis and post pars plana vitrectomy with intraocular foreign body removal with tectonic keratoplasty) [Table 3]. Infectious keratitis is one of the important reasons for visual loss in developing countries. Therapeutic and tectonic keratoplasties constitute a significant number of corneal transplants in India  and are effective in decreasing the infectious load, maintaining globe integrity, and preserving visual function.,,, GPC can be used safely in infectious keratitis for preserving visual acuity and globe integrity with acceptable complication rate and reasonably good visual outcomes, especially when FCT is not available. In the present study, globe integrity was preserved in more than 90% patients with successful eradication of infection and restoration of visual function. Delayed diagnosis, inappropriate management, and the lack of modern medical facility in rural areas are some of the reasons that result in a delay in seeking specialist's opinion and optimal treatment. In turn, it makes the corneal transplant inevitable. Moreover, access to sight-restoring keratoplasty is limited in some of the developing countries due to shortage of FCT, lack of developed eye bank network, and prohibitively high cost of imported tissue. Utilizing GPCs may substantially alleviate the problem of availability, cost, storage, and transportation. Glycerol is a chemical compound commonly called glycerin. It is a colorless, odorless, and viscous liquid. As a dehydrating agent, it has antimicrobial and antiprotease properties, and it is known to maintain the corneal structure. These properties make it suitable for long-term storage of cornea and useful for those clinical indications where viable cell layer is not required., Although cornea preserved in glycerol does not have a viable endothelium. Still, it can be used for globe-salvaging surgeries as seen in the present study. Another benefit of glycerol-preserved tissue is readily available for emergency condition and its lower cost compared to the FCT. Furthermore, it can be preserved at room temperature and can be used for transplantation for 5 years. Thus, GPC is a suitable alternative in infective keratitis with impending perforation or in cases of patients presenting with perforations or globe rupture postinfections or trauma. The acellular glycerol-preserved tissue lacks antigen-presenting cells and therefore cannot directly sensitize the recipient T cells, making rejection a nonissue, which is associated usually with fresh cornea., The absence of graft rejection in the present study supports this theory. Li et al. found significantly less (P = 0.006) rejection rate in their study in those receiving a glycerol-cryo-preserved corneal transplant as compared to corneal transplant done with a FCT. Furthermore, the use of GPC precludes the postoperative use of corticosteroids or immunosuppressive agents to prevent or suppress graft rejection and thus prevents reinfection and reduces the cost of treatment. This is of immense importance in a developing country like India where follow-up and compliance with long-term immunosuppression therapy is poor. In our study, only one patient developed reinfection of graft and endophthalmitis after TPK. This patient presented with globe perforation with lens extrusion at the time of presentation. We assume that in this case, the infection might have transmitted from anterior to posterior segment presumably due to the absence of barrier effect of the lens. The incidence of post-PK glaucoma is around 10%–53%,,, being higher in cases of therapeutic keratoplasty due to larger graft size and inflammation. We observed that high intraocular pressures prevailed in a third of our cases, 41.6% of who were successfully managed conservatively [Table 2]. Lin et al. demonstrated good cosmetic results utilizing GPC for tectonic keratoplasty with anterior vitrectomy with/without conjunctival flaps as an adequate substitute for evisceration in patients with perforated keratitis. All the patients in their study had little or no visual potential. In our study, the ocular integrity with visual potential was maintained in 91.2% patients, and visual acuity of 6/36–6/12 in 14.7% patient was maintained after second corneal transplant with a FCT. Anatomical integrity was maintained in 86.7% patients without recurrence of infection and complications using cryopreserved cornea (at −20°C) in BSS with antibacterials and antifungals for therapeutic PKP in perforated fungal corneal ulcers in a study by Yao et al. Comparable results were achieved using GPC that can be stored at room temperature or 4°C in the regular refrigerators in eye banks without any antibiotics given the antibacterial properties of glycerol. There is a paradigm shift in the corneal transplant in recent years, from full-thickness corneal transplant to removing only the diseased layer of the cornea improving the graft survival rate and reduced the chances of rejection. Deep anterior lamellar keratoplasty (DALK) does not need donor endothelium and requires less rigid criteria for donor corneal tissue quality. Furthermore, the advantage of DALK over PKP is the elimination of endothelial rejection., However, there is a risk of epithelial and stromal rejection as epithelial cell, keratocytes, and bone marrow-derived cell are the antigens that might be responsible for rejection in DALK , Glycerol-preserved tissue can be an effective method sans complications. A study by Li et al. compared DALK in the high-risk cornea by glycerol cryopreserved corneal tissue (GCCT) in one group with FCT in the other group. They found postoperative BCVA of 20/40 or better at the last follow-up in 57.6% in GCCT group and 54.8% in the FCT group. They found no episode of graft rejection in GCCT group versus ten episodes of stromal rejection in FCT group. They concluded that the overall rejection-free graft survival rate of 2 years was significantly higher (P = 0.006) in the GCCT group (100%) than FCT group (78%). The limitation of this study is that this is a retrospective study with a small sample size. Furthermore, the second optical transplant could be performed in very few patients. Nevertheless, the paucity of literature from South Asia in general and particularly in India, on the subject given its potential to reduce the cost and morbidity, lends credence to our observations. Prospective randomized control trials can be done in future comparing other methods of long-term corneal preservation with glycerol preservation. In our opinion, it is prudent to undertake keratoplasty with GPC (in the case of nonavailability of FCT) in emergency, instead of subjecting the patient to evisceration or enucleation given its cosmetic and psychological implications. The use of glycerol-preserved tissue for lamellar transplant can increase the success rate in high-risk transplant and can increase the corneal pool in developing countries with a paucity of FCT. We acknowledge Dr. Rohit Gupta, Mr. Rahul Gupta, Dr. Ila Sethi, Dr. Sohaib Ahmed, Dr. Ravi Gupta, Dr. Lalit Singh, Dr. Kakkar, Mr. MM Mathavan and Dr. Amit Maitreya for helping us in editing this manuscript. Kumari A, Gupta R. Indications for penetrating keratoplasty in Western India. Int J Recent Trends Sci Technol 2013;8:256-9. Tabin GC, Gurung R, Paudyal G, Reddy HS, Hobbs CL, Wiedman MS, et al. Penetrating keratoplasty in Nepal. Cornea 2004;23:589-96. Dandona L, Ragu K, Janarthanan M, Naduvilath TJ, Shenoy R, Rao GN. Indications for penetrating keratoplasty in India. Indian J Ophthalmol 1997;45:163-8. Ghosheh FR, Cremona F, Ayres BD, Hammersmith KM, Cohen EJ, Raber IM, et al. Indications for penetrating keratoplasty and associated procedures, 2001-2005. Eye Contact Lens 2008;34:211-4. Williams KA, Muehlberg SM, Lewis RF, Coster DJ. How successful is corneal transplantation? A report from the Australian Corneal Graft Register. Eye (Lond) 1995;9(Pt 2):219-27. Dandona R, Dandona L, Naduvilath TJ, McCarty CA, Rao GN. Awareness of eye donation in an Urban population in India. Aust N Z J Ophthalmol 1999;27:166-9. Saini JS. Realistic targets and strategies in eye banking. Indian J Ophthalmol 1997;45:141-2. Rao GN. Cornea and blindness. Indian J Ophthalmol 1994;42:169. Dandona L, Naduvilath TJ, Janarthanan M, Ragu K, Rao GN. Survival analysis and visual outcome in a large series of corneal transplants in India. Br J Ophthalmol 1997;81:726-31. Lin HC, Ong SJ, Chao AN. Eye preservation tectonic graft using glycerol-preserved donor cornea. Eye (Lond) 2012;26:1446-50. Gogia V, Gupta S, Agarwal T, Pandey V, Tandon R. Changing pattern of utilization of human donor cornea in India. Indian J Ophthalmol 2015;63:654-8. Nobe JR, Moura BT, Robin JB, Smith RE. Results of penetrating keratoplasty for the treatment of corneal perforations. Arch Ophthalmol 1990;108:939-41. Killingsworth DW, Stern GA, Driebe WT, Knapp A, Dragon DM. Results of therapeutic penetrating keratoplasty. Ophthalmology 1993;100:534-41. Cristol SM, Alfonso EC, Guildford JH, Roussel TJ, Culbertson WW. 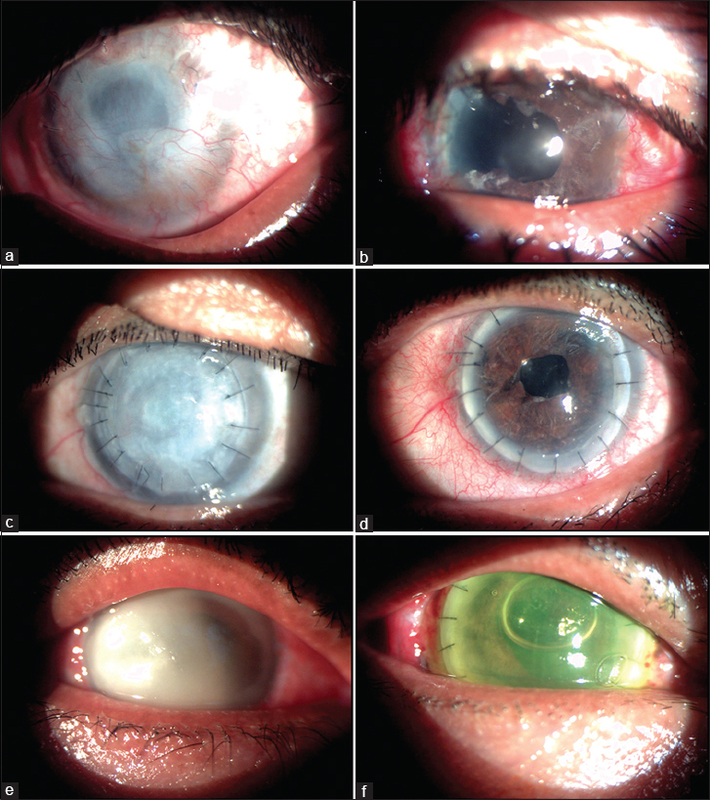 Results of large penetrating keratoplasty in microbial keratitis. Cornea 1996;15:571-6. Jonas JB, Rank RM, Budde WM. Tectonic sclerokeratoplasty and tectonic penetrating keratoplasty as treatment for perforated or predescemetal corneal ulcers. Am J Ophthalmol 2001;132:14-8. Feilmeier MR, Tabin GC, Williams L, Oliva M. The use of glycerol-preserved corneas in the developing world. Middle East Afr J Ophthalmol 2010;17:38-43. King JH Jr., Mctigue JW, Meryman HT. Preservation of corneas for lamellar keratoplasty: A simple method of chemical glycerine-dehydration. Trans Am Ophthalmol Soc 1961;59:194-201. King JH Jr., Townsend WM. The prolonged storage of donor corneas by glycerine dehydration. Trans Am Ophthalmol Soc 1984;82:106-10. Moore MB, Gebhardt BM, Verity SM, McDonald MB. Fate of lyophilized xenogeneic corneal lenticules in intrastromal implantation and epikeratophakia. Invest Ophthalmol Vis Sci 1987;28:555-9. Chen W, Lin Y, Zhang X, Wang L, Liu M, Liu J, et al. Comparison of fresh corneal tissue versus glycerin-cryopreserved corneal tissue in deep anterior lamellar keratoplasty. Invest Ophthalmol Vis Sci 2010;51:775-81. Li J, Yu L, Deng Z, Wang L, Sun L, Ma H, et al. Deep anterior lamellar keratoplasty using acellular corneal tissue for prevention of allograft rejection in high-risk corneas. Am J Ophthalmol 2011;152:762-70.e3. Karesh JW, Nirankari VS. Factors associated with glaucoma after penetrating keratoplasty. Am J Ophthalmol 1983;96:160-4. Kirkness CM, Ficker LA. Risk factors for the development of postkeratoplasty glaucoma. Cornea 1992;11:427-32. França ET, Arcieri ES, Arcieri RS, Rocha FJ. A study of glaucoma after penetrating keratoplasty. Cornea 2002;21:284-8. Yao YF, Zhang YM, Zhou P, Zhang B, Qiu WY, Tseng SC. Therapeutic penetrating keratoplasty in severe fungal keratitis using cryopreserved donor corneas. Br J Ophthalmol 2003;87:543-7. Shimazaki J. The evolution of lamellar keratoplasty. Curr Opin Ophthalmol 2000;11:217-23. Anshu A, Parthasarathy A, Mehta JS, Htoon HM, Tan DT. Outcomes of therapeutic deep lamellar keratoplasty and penetrating keratoplasty for advanced infectious keratitis: A comparative study. Ophthalmology 2009;116:615-23. Watson SL, Ramsay A, Dart JK, Bunce C, Craig E. Comparison of deep lamellar keratoplasty and penetrating keratoplasty in patients with keratoconus. Ophthalmology 2004;111:1676-82. Yamagami S, Ebihara N, Usui T, Yokoo S, Amano S. Bone marrow-derived cells in normal human corneal stroma. Arch Ophthalmol 2006;124:62-9. Kamiya K, Hori J, Kagaya F, Usui T, Amano S, Oshika T, et al. Preservation of donor cornea prevents corneal allograft rejection by inhibiting induction of alloimmunity. Exp Eye Res 2000;70:737-43. Javadi MA, Feizi S, Javadi F, Kanavi MR, Ghasemi H, Karimdizani S, et al. Deep anterior lamellar keratoplasty using fresh versus cryopreserved corneas. Ophthalmology 2014;121:610-1.